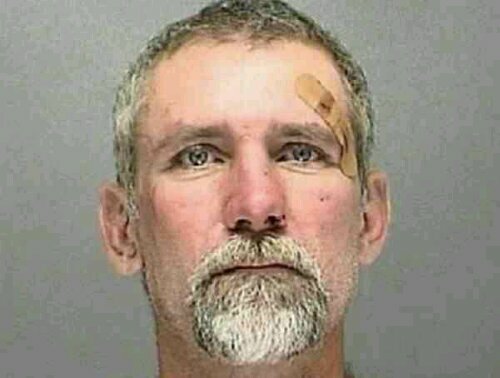 Florida: Man calls his daughter a “N****er Lover” and beats her boy friend with a brick!!! A 44-year-old Florida man is custody after being accused of throwing pieces of bricks at children and shouting racial slurs at them before trying to escape from police on his ex-wife’s bicycle. According to The Daytona Beach News-Journal, police responded to a Dec. 16 call that Larry Kenton was drunk and causing as disturbance at his ex-wife’s home. Kenton began arguing with his daughter because he did not approve of her dating an African-American youth and referred to her as a “n*gger lover,” according to the arrest report. As he was exiting the home, he apparently saw the boyfriend and shouted, “You are the one!” Kenton was accused of hitting the boy in the face and the head, and then choking him. Police said that he then picked up a brick and used it to strike the boy in the back of the head. After an unidentified man came to assist the boy, Kenton began shouting racial slurs at nearby children and throwing pieces of bricks at them. The arrest report said that at least two of the children were hit. He faces charges on multiple counts of aggravated child abuse, resisting an officer, driving under the influence, driving with license revoked and battery. This scumbag needs to be locked UNDER the jail. SMH. Next Next post: 63 year old Mayoral candidate beaten up by two teenage girls with a billy club at Mall of America Starbucks after their male accomplice stole his iPhone. Ah, dreaded and feared the world over, Florida Man strikes again. Enlightenment & Entertainment Florida: Man calls his daughter a “N****er Lover” and beats her boy friend with a brick!! !